Technology is gradually eroding our ability to perform certain tasks, and parking is one of them. Eventually we won’t need to be able to park because our vehicles will do it for us – in some cases, they already do. But until almost all vehicles are able to safely manoeuvre your vehicle into a narrow, tight space, you will need to know how to perform the three different types of parking in a car. Angle parking is parking spaces that are at an acute angle to the kerb or wall. In almost all cases you drive in forwards and reverse out. The reversing part is dangerous because the view up the road is obscured by the rear pillar. For this reason, cyclists pay special attention to vehicles when they are cycling past angle parks. In this video from America, it shows roughly at what point you should start turning. The length of your vehicle will influence this. Be careful when angle parking if you have a front splitter, body kit or bumper that is lower than the kerb otherwise you may damage the corner of it. 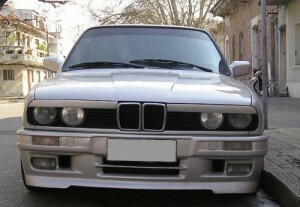 You can see that this BMW’s front splitter is lower than the kerb. Perpendicular parking is where the parking spaces are at 90 degrees to the wall or kerb. They are more difficult to manoeuvre into, and need to be slightly wider, therefore take up more space than angle parking. It’s most effective to reverse into a perpendicular parking space as you can get a slightly tighter manoeuvring angle, and it’s safer when exiting the parking space. Here’s a fairly self-explanatory video from America (imagine the steering wheel is on the other side). Also, bear in mind that the parking spaces in America are huge, and he doesn’t do a great job of positioning the car, but the technique behind the imaginary line is sound. Parallel parking is where you park your car parallel to the wall or kerb. There’s a risk that you will get too close to the kerb and damage your alloy wheels, but parallel parking is quite easy once you know when to turn the wheel. 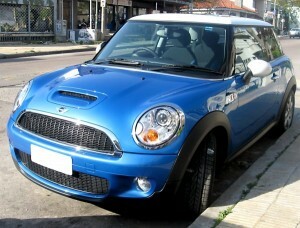 You can see that the driver of the Mini has pointed their wheels towards the kerb. This is recommend if you are facing downhill because if the handbrake fails the car won’t run down the hill. This video from the UK is one of the better ones at explaining how to parallel park. If you think you are bad, you can’t be any worse than this – quite possibly the worst attempt at parallel parking ever, fresh from Ireland. The driver turns too late, comes in at too much angle and generally makes a real mess of it. Eventually a passing pedestrian (with the patience of a saint) helps. Most new cars come with reversing sensors now, and many come with sensors on the front bumpers and sides. Sensors on the sides allow for automated parallel and perpendicular parking, as well as Rear Cross Traffic Alert which scans up the road as you reverse out of a parking space. Sometimes the sensors provide acoustic feedback using a beep that increases in frequency as you approach an object; sometimes you may get a visualisation on a screen; sometimes there’s both. Many cars now have reversing cameras. Modern car designs have smaller rear windows, thicker rear pillars and higher belt lines for safety and style. These make it more difficult to see what’s behind the car, and judge where the corners are. Some camera systems overlay graphics that are linked to the steering angle, showing lines that indicate your projected path. Others attempt to identify objects that might be slightly more difficult to interpret on a screen, such as sharp corners on buildings, or poles and posts. Premium cars may also have cameras on the front facing forward or sideways, or on the side to view how far the wheels are from the kerb. These systems mostly work on parallel parking, although some will do perpendicular parking, too. The driver usually remains in control of the gears, throttle and braking while the vehicle does the steering. These systems are not fool proof – heavy rain and very dark conditions make it more difficult for them to work effectively – but work well almost all the time. Autonomous parking is where your vehicle will park itself for you, but you don’t have to be in it. The vehicle will take over all facets of the parking manoeuvre – braking, throttle and steering. When you return to your car, the vehicle will extract itself from the parking space and then you can get in. Here’s an example using a Volkswagen EOS. It looks a little unsteady, but eventually gets there. Expect to see this on commercially available vehicles within a couple of years. Automated parking buildings take your car and park it for you using a computerised mechanical tray. Check this example in VW’s theme park as it’s similar to automated parking you can find in other cities where space is at a premium. ‹ Reversing cameras and reversing sensors: What are they and how do they help? Reversing cameras and reversing sensors: What are they and how do they help?